1.Prepare your favorite white cake mix, then divide the batter evenly among six small bowls. Following the chart below, dye each bowl of batter a rainbow color. 2.Line 16 muffin pan wells with baking cups. Evenly distribute the purple batter among the cups, then the blue, and so on, following the order shown. As you go, gently spread each layer of batter with the back of a spoon to cover the color underneath. 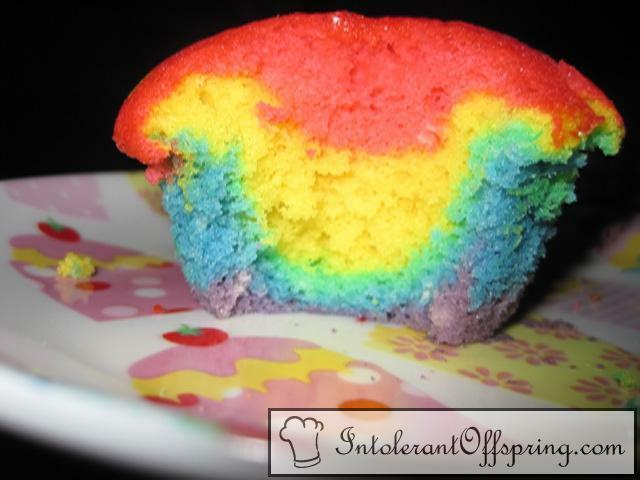 3.Bake the cupcakes according to your recipe directions. Before serving, remove the paper wrapping, and if you like, top each cupcake with a whipped-cream cloud.